Australia’s leading tapware brand Dorf, has launched the new Viridian tapware range aimed at bringing affordable style to every home. The new Viridian Mixer Range will impress homeowners with its clean lines and smooth surfaces delivering a stylish solution for both commercial and domestic bathroom spaces. The mixer range features the Dorf Viridian Basin Mixer, Bath Shower mixer (diverter option available), wall bath mixer and wall bath outlet. The whole range incorporates Dorf SureFit® installation technology, reducing the risk of scratching the back plate during installation and providing peace of mind. Both the basin and shower mixers create a contemporary style suited for any bathroom space. To make installation easier the bath shower mixer is also available as a separate body and trim kit to allow for early rough in. The range is further strengthened by the Dorf Viridian sink mixer range. 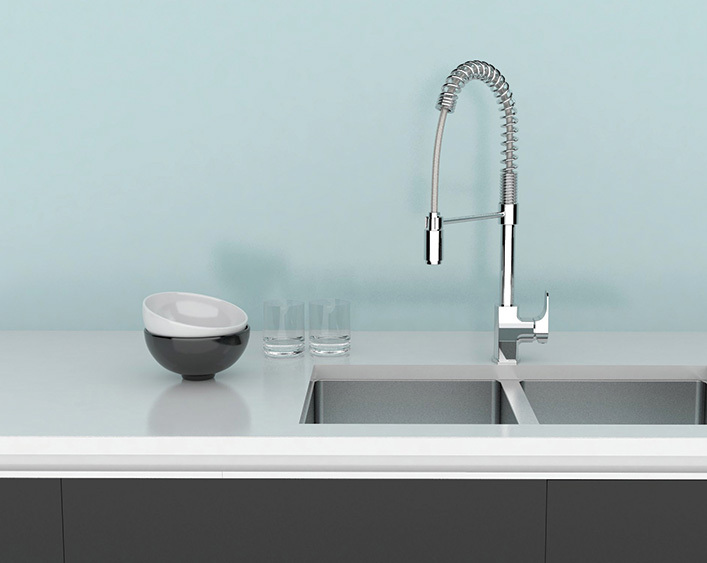 The range includes both the sink mixer and pull down sink mixer, bringing the same contemporary style to the kitchen whilst adding extra functionality. For added durability the Pull down Sink Mixer features a stainless steel braided hose with PVC hosing. The Dorf Viridian range includes Dorf’s water efficient technology to deliver the perfect balance between water savings and optimum performance. The Basin Mixers are WELS 5-star rated and the Sink Mixers WELS 4-star rated for water efficiency. For the ultimate coordinated look, the Viridian tapware range can be matched with existing showers and accessories. For further information on the Dorf Kip and Viridian tapware ranges please visit www.dorf.com.au or call 13 14 16.